PAX is hands down the most exciting event of the year for the Harmonix community team, as it gives us a chance to meet with awesome fans from all around the world. 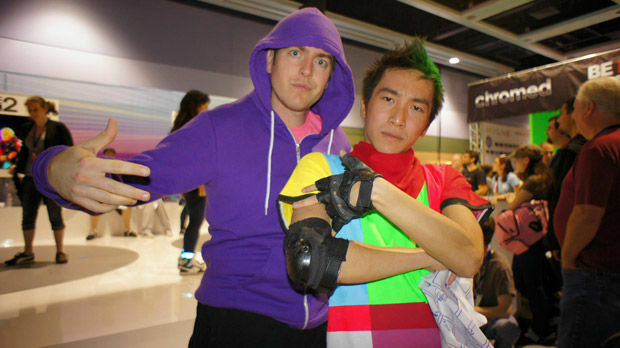 During PAX Prime 2011, we had an exceptional cosplayer, David Nguyen, swing by our booth as Dance Central 2’s Glitch. David had covered every single detail in his costume, from the hand-painted test pattern shirt to the green streak in his hair. His love for Dance Central characters and his incredible abilities as an artist made him the perfect fit to create art for Dance Central 3’s credits sequence. We were psyched to have such a talented member of our community be a part of the project. The amount of love and detail he has put in each of his Dance Central costumes is well represented in each pixel sprite that he has created. We’re thrilled that we can share his amazing work with fans from all parts of the world! Hey everyone! Before I begin, I just wanted to thank everyone at Harmonix for giving me the opportunity to do something for one of my favorite game series. If someone had told me last year that I would be working on the credits of Dance Central 3, I probably would have just laughed it off and said “The Glitch costume doesn’t actually mean I work for Harmonix!” But it’s funny how things pan out. I studied animation at the Emily Carr University of Art and Design in Vancouver. I strictly work with 2D animation, as I fear anything that involves mathematics (I kid; I’m just terrible at it). I’ve always been interested in pixel art (Paul Robertson is one of my idols), but I’ve only ever dabbled in it. I didn’t really dive into it until I decided to animate my grad film, Insert Credit, in sprite/pixel art. Since then, I’ve fallen in love with pixel art. I try to take current games and work them into pixel art now and then to hone my simplification techniques; that’s actually how I was approached to work on DC3! [Dance Central 3 Project Director] Matt Boch seemed to really dig my Dance Central/Pokemon crossover pictures (which… I need to make more of!) and he cryptically asked me over Twitter if I would want to work on something awesome that I would probably love doing. After signing the NDA, he told me that he’d call me and go over the entire project with me. It’s funny, because I was actually with Raffy (@RiffraffDC) at his apartment when I got the call. I think I told Raffy something vague about having a super important call and he let me use his bedroom for some privacy. When Matt went over the story of DC3 with me (which was COMPLETELY bonkerz.net) and told me what I’d be doing, I was floored. As a huge fan of the series and of Harmonix, this was the best thing that I’ve ever worked on. I think I was having a giggle-fit when I went back into the living room… Thankfully, challenging Raffy to another dance battle was an easy way to change the subject. I created animated sprites of the Dance Central 3 crews in a 16-bit style and I worked on translating [Harmonix artist] Matt “Perly” Perlot’s incredible drawings into pixel art. As a fan, working on this was pure joy. Not only was I contributing to the game, I got to see everything before the rest of the fans! Dare’s adorable makeover, the new DCI crew, and The Glitterati’s “Haute Blooded” outfits all elicited a huge reaction from me that I had to suppress in public! 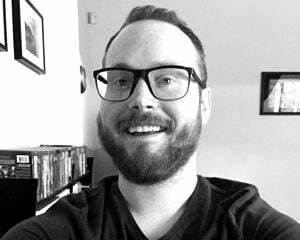 [Producer] Tom Bartlett got things started and helped guide me along, while Matt Perlot sent me all the concept art and gave me critiques on the work. In fact, Rasa and Lima’s animations were completely Perly’s ideas. I only had their character models in a T-pose to work with, so I couldn’t gauge their personalities through voice or actions. I actually think they ended up being my favorites to work on! 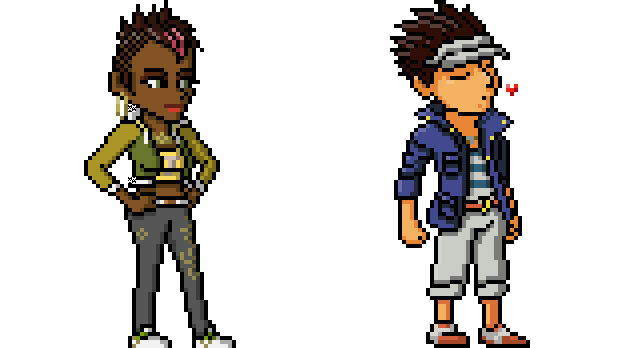 Digging into things like MacCoy’s goofy answering machine quotes from Dance Central 1 and translating that into a silly sprite was also blast to do. The most challenging thing about working on the sprites was probably my obsessive attention to certain details that probably didn’t matter that much… I think I spent too much time going over and revising things like Aubrey’s anchor bracelet. But you know what? Harmonix and the Dance Central fans deserve that kind of obsessive quality, so I don’t regret it one bit! I was SO relieved to be able to talk about the game when it released. I remember while hanging out at the Harmonix booth at PAX, [Director of Communications and Brand Management] John Drake was telling [Community Manager] Eric Pope “Yeah! He’s the one that did the ending credits!” while pointing at me. All I could muster up at the moment was nervous laughter while thinking “IS IT OK FOR THEM TO BE SAYING THIS HERE? !” and failing to come up with a different topic to change to. I love those guys. I think the hardest part about keeping mum on the subject was watching the Glitterati fans become progressively more distraught because the crew hadn’t been announced as the game reached closer to launch day. The poor things… It was all worth it though. I’ve gotten the nicest messages from people, telling me how much they liked the credits and how surprised they were to see them! Fans seemed to have really liked Lil’ T and the dinosaur egg, or anything involving Glitch, but my personal favorite was the Glitterati illustration. When Perly sent me a reference shot, he also sent me pictures of their new outfits. I was so excited and inspired that I actually worked on that piece without resting from start to finish! It’s been really flattering and surreal seeing people compliment my work and posting it up on Tumblr and such. I guess that’s the word that best describes how I feel about all of this. “Surreal.” When I saw my work pop up at the end of the game, I just sat down with a stupid grin plastered on my face. I couldn’t stop thinking about how I got this chance. Cosplay? Twitter? Fan art? Harmonix having an incomparable love for their fans? I can only wish that I get to work on something in the future that made me half as happy as this did.